At its Ignite conference, Microsoft announced a preview of its new quantum computing platform, and unveiled its plans for a topological quantum computer relying on recent advancements in particle physics. Microsoft quantum preview will include a quantum computing simulator and a new quantum computing programming language integrated in Visual Studio. According to Microsoft, their topological qubits will perform computations longer and more consistently, with fewer errors. Microsoft vision also includes a scalable general-purpose topological quantum computer, which is still in its early stages of development. Satya Nadella, Microsoft CEO, provided more insight into Microsoft quantum plans moderating a virtual panel with the participation of four members of Microsoft quantum team: Krysta Svore, computer scientist; Michael Freedman, mathematician and pioneer of topological quantum computation; and Charlie Marcus and Leo Kouwenhoven, both physicists, in charge of building Microsoft topological quantum computer. The main idea behind Microsoft quantum computer is the topological qubit, which is made of a new form of matter, says Freedman. This topological matter has the property that the information it stores is not localized in a specific place. Instead, it is stored globally, within its topological structure. This idea can be explained thinking of a loop of a string, which can be knotted or not. You cannot look at any local property of it to determine whether that loop is knotted or not. Rather, you have to look at the global picture, that is, its topology. The physical effect behind that property is electron fractionalization, a process which splits an electron, which can be present or not in a given spot, into Majorana fermions. Those particles encode the original information of the electron and spread it across the whole matter, so it becomes a global property of it. Majorana particles, explains Kouwenhoven, one of their first observers in 2012, can be observed only at very low temperature. They are quantum superpositions of two simultaneous states, one where the particle is present, and the other where it is not. The main benefit of the global storage of information is that it becomes protected from local errors. The foundational step in building a real topological quantum computer is having one of those fractionalized electrons affect another one, and this in turn affects another one, and so on. This is the building block of Microsoft quantum chip, of which Marcus even showed a prototype. One of the challenges involved is finding a way to control it without ever measuring it, since that would destroy the superposition effect. 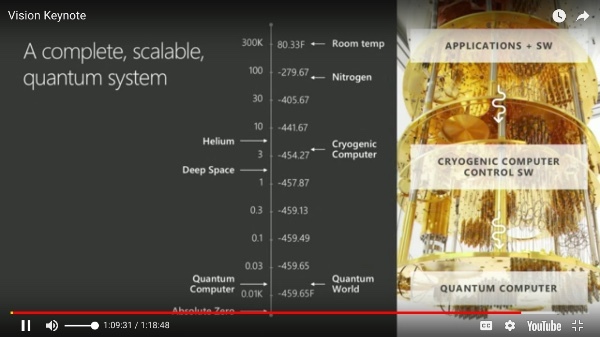 Microsoft's solution is based on a cryogenic classical computer, working at 4K, which is responsible for controling the quantum chip, working at 0.01K. This new language will be fully integrated in Visual Studio, with support for syntax coloring, debugging, and testing. The debugger will be able to show how the system quantum state evolves through time. Visual Studio will include a quantum simulator of up to 30 qubits. Additionally, a more powerful Azure-based simulator will provide up to 40 qubits. The field of quantum computing has seen growing interest in recent years and Microsoft is not the first player in the arena. Most notably, IBM recently announced its 16 qubit processor and quantum SDK QISKit, while Chinese researchers also achieved important milestones. Microsoft's preview of its quantum platform is expected to be released by the end of this year.